This cache replaces GC4PQ9C. Village signs is a new series of caches based on the ornate signs that depict the heritage, history and culture of the villages that put them up (normally on the village green!). You are looking for a small tube in a location from which you can see the sign. It's a busy spot, please hold on tight to small cachers and dogs. 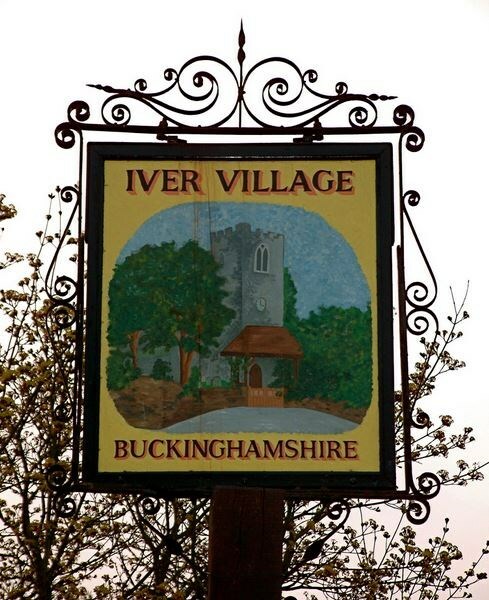 Iver village: The name 'Iver' is Saxon in origin recorded first in 893 and the parish church of St. Peter has Saxon work in the nave. Iver is mentioned in the Domesday Survey of 1086 with it's Saxon name of Evreham. The name means the settlement (“ham”) on the slope (“evre”) above the valley of the Colne Brook . Today Iver Village is the centre of an extended Parish. Apart from residential areas, local shopping facilities and first and junior schools there is still agriculture practised. Sheep and horses graze and chickens are reared. Light industry ranges from motor vehicle maintenance to food production. Warehouses make use of the nearby motorway network for the distribution of a diversity of products. The villagescape has changed much in the last two centuries but the heart of the village is a conservation area, designated in 1982.